NEWARK — Take a left at the tunnel of treats and you’d find yourself approaching Ice Kingdom at the Prudential Center on Sunday. 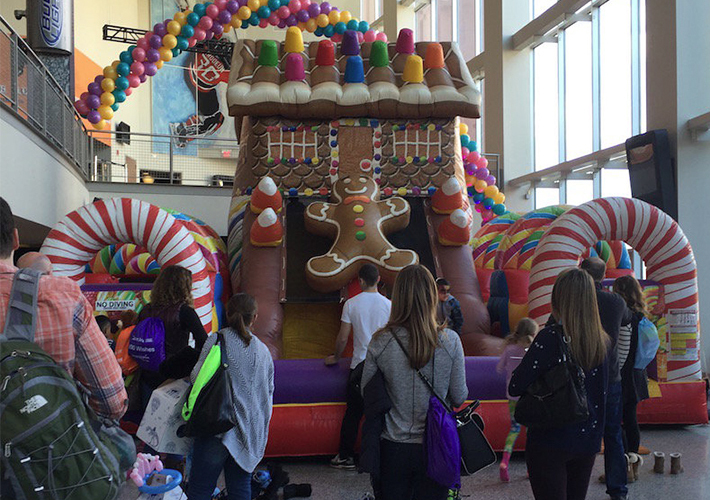 The arena transformed into a candy land for a fundraiser hosted by CareOne, a senior health care provider, to raise money for the state’s chapter of Make-A-Wish Foundation. The event raised $1.3 million as of the event’s closing and the event’s $2 million goal was expected to be reached, said a spokeswoman for CareOne. Nico Amadio, a 10-year-old who lives in Bloomingdale, swam and fed dolphins in the Bahamas as part of his wish granted by the foundation. He was diagnosed with AVM, a malformation of blood vessels in his brain, two years ago. Amadio was there on Sunday with his family to take part in the fun. “We’re just really happy to be a part of it,” Nico’s mother, Jeannina Amadio said. The smell of popcorn filled the arena as children ran around to take pictures with the people dressed up as movie characters, to jump on the inflatable bouncy houses at the event and get their faces painted. Tickets to the fundraiser were $125 per adult and $25 per child. The tickets included food, drinks, games and face painting. Different booths offered other take-home gifts, such as a Build-a-Bear stuffed animal and candy from Dylan’s Candy Bar. Each wish, on average, costs about $10,000.